A palm-sized piece of the World Trade Center steel that was reduced to rubble on Sept. 11, 2001, will be on display inside a Jefferson City business indefinitely. 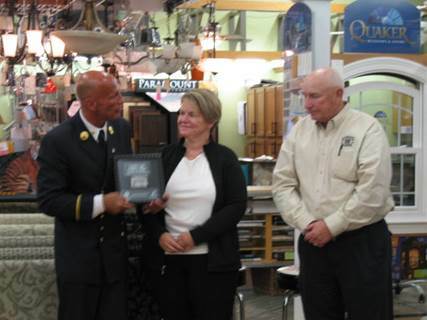 On behalf of the Stephen Siller Tunnels to Towers Foundation, Jack Oehm, a retired New York City Fire battalion commander, presented the steel to Stephanie Scruggs, president of Scruggs Lumber, and her father and former president of the company, Bob Scruggs on Thursday for their efforts in securing a smart home for 27-year-old paralyzed veteran Tyler Huffman, of Jefferson City. While serving as a Marine in Afghanistan, the then 22-year-old Huffman was shot by an enemy sniper, causing him to be wheelchair-bound. To read the full story view NewsTribune.com.